The artists in the Arts and Crafts movement in England began creating simple and organic pieces out of wood, metal, and stone in response to the rise of factory-produced goods. When the movement came to America in the late 1800's, artisans embraced the ideas and began to create furniture, jewelry, and other items with a focus on natural and local materials and nature themes. 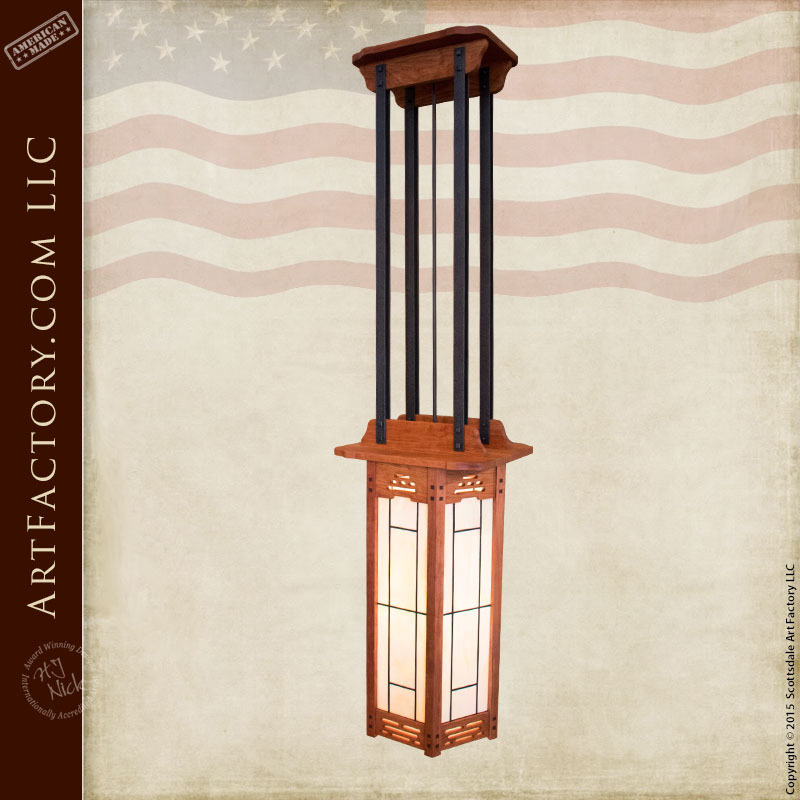 Beautifully finished hardwood and glass creations became popular interior and exterior lighting. Simple and clean lines are one of the hallmarks of the Craftsman style. This pendant light is a fitting tribute to nature and simplicity. Our master woodworkers used solid cherry wood for the frame and carefully pieced together the hexagonal shape. Amber leaded glass was used for the panels to create a warm glow. The long supports are hand-forged iron, providing a stable support for this large pendant. Use a single large pendant to light your foyer or use a grouping of smaller ones for your dining room. The options are endless for this clean and classic Craftsman Lighting Pendant Chandelier.